SCOTTSDALE, Az., May 31, 2018 /Christian Newswire/ -- Singles of all ages wonder why it's so hard to meet, date and marry today. In fact, 50 percent of America is single and fewer people are committing to marriage, according to the Bureau of Labor Statistics, 2014. Dating has been replaced by "hooking up" and "hanging out," making the traditional days of "courtship" obsolete. Or, is it? THE DATING PROJECT, the new documentary from Paulist Productions, Mpower Pictures and Family Theater Productions, has been featured in The Washington Post, Boston Globe and Chicago Tribune as well as on CNN and FOX NEWS, and will now be available on DVD and Digital Download from Pure Flix. The film will be released into the general consumer market by Universal Pictures Home Entertainment. The official trailer for THE DATING PROJECT can be viewed at www.thedatingprojectmovie.com. A few years ago, Boston College professor Kerry Cronin noticed this decreased dating trend among her undergrad students. "And I thought, 'Well, this is crazy.' So I started asking students to go on what I refer to as 'traditional dates' as part of an extra-credit assignment." However, the act of going on a date was more complicated than she thought. A combination of the prevalent "hook up" culture, as well as the preferred method of social interaction (texting), had all but obliterated skills of basic social interaction. And so, THE DATING PROJECT began. THE DATING PROJECT follows Professor Cronin and five modern-day singles (ages 20 – 40) in their own quest to find authentic love and meaningful relationships. By engaging in Cronin's dating philosophy, her mentees find more fulfilling and lasting relationships. Watch the official trailer: www.thedatingprojectmovie.com. Critically-acclaimed author Suzanne Venker said THE DATING PROJECT is "a wake-up call for Americans, many of whom are in the dark about how dramatically dating has changed" in a FoxNews.com op-ed. "For a host of different reasons, Americans are broken. They want love, but no one has shown them the way. That's what makes THE DATING PROJECT, in my estimation, the most important documentary in recent years — for what jumps off the screen is our culture's abdication of love as even a concept, let alone a reality." "This documentary is a must-see for anyone concerned about the impact our over-sexualized world is having on the most basic of relationships, especially among young people," said Teresa Tomeo, media expert, motivational speaker, bestselling author and syndicated Catholic talk show host of "Catholic Connection" and "The Catholic View for Women." "THE DATING PROJECT is an eye-opener that will hopefully help Generation Y and the rest of us realize we all deserve better than what the hook-up culture claims to offer." "THE DATING PROJECT is a cultural avalanche," said Sr. Nancy Usselmann, director of the Pauline Center for Media Studies. Universal Pictures Home Entertainment (UPHE - www.uphe.com) is a unit of Universal Pictures, a division of Universal Studios. Universal Studios is a part of NBCUniversal, one of the world's leading media and entertainment companies in the development, production, and marketing of entertainment, news, and information to a global audience. NBCUniversal owns and operates a valuable portfolio of news and entertainment television networks, a premier motion picture company, significant television production operations, a leading television stations group, world-renowned theme parks, and a suite of leading Internet- based businesses. NBCUniversal is a subsidiary of Comcast Corporation. Founded in 2005, and led by partners Michael Scott, David A.R. White, Elizabeth Travis, Alysoun Wolfe, and Jim Ameduri, Pure Flix is the leading independent faith and family studio in the world. Pure Flix's recent releases include: God's Not Dead: A Light in Darkness, Samson, The Case for Christ, God's Not Dead 2, God's Not Dead, Do You Believe?, Woodlawn, A Question of Faith, and Same Kind of Different as Me. With offices in Los Angeles and Scottsdale, Pure Flix has produced, acquired, marketed, and distributed over 100 faith and family-friendly films. Aligned with their vision to influence the global culture for Christ through media, Pure Flix is the industry leader in creating high-quality inspirational feature film content. The studio's official website is Pureflixstudio.com. The company also features a leading streaming video on demand service, with thousands of movies, originals, TV shows and more emphasizing faith, family and fun. For more information, go to Pureflix.com. Mpower Pictures is a film production company dedicated to "empowering" both the artist and the audience by telling stories that are compelling, bold, and uncompromising. Steve McEveety, CEO (The Passion of the Christ, Braveheart), John Shepherd (Bobby Jones, The Ultimate Gift), Todd Burns and David Segel launched Mpower in 2007 to make movies that profoundly impact culture, while inspiring and entertaining audiences. The company was awarded Heartland Film Festival's "Truly Moving Picture" award for its feature films Snowmen and The Stoning of Soraya M.
Family Theater Productions tells stories that inspire, entertain and inform. Founded in 1947 by Father Patrick Peyton, C.S.C., and headquartered on Sunset Boulevard in Hollywood, Family Theater Productions is an award-winning producer of family-suitable and faith-based media for radio, film, television and digital media. The Head of Production is Father David Guffey, C.S.C. 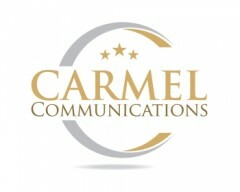 For more information, or to schedule an interview, please contact Kevin Wandra (404-788-1276 or Kwandra@CarmelCommunications.com) of Carmel Communications.